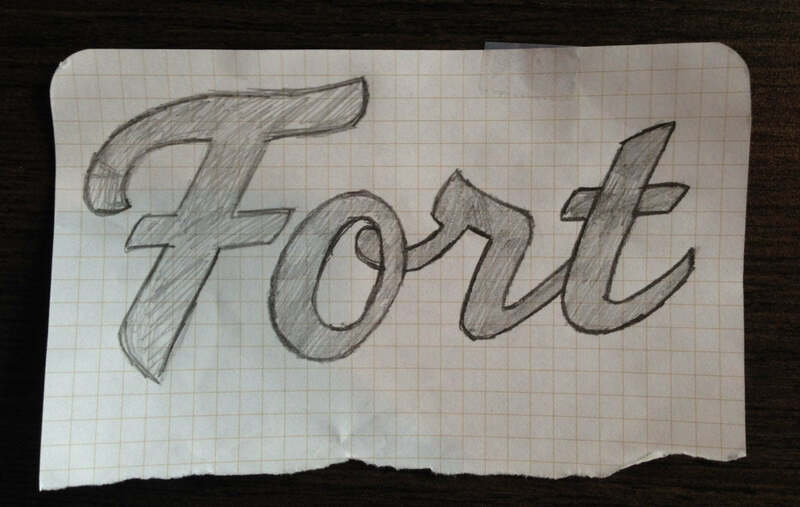 Behind-the-scenes posts are something I enjoy, so I'd thought it'd be fun to share the process of how the Fort script logo was developed. Maybe this will be helpful for you or just amusing. Enjoy. The first is nothing special. The second had simple shadows that livened it up. It's a stretch, but the thought was the two horizontal parts of the F could also be a platform fort in a tree. The third fit the letterforms to the shape of an equilateral triangle, but it felt too macho. All in all, I wasn't fully happy with any of these directions. A Key to the Fort? But, the word “Outfitters” had more of a clothing feel / focus, which would put type in the background—something I didn't want to happen. The key just didn’t fit right. I thought the logo was getting locked in and we were good to go... And then, it all blew up. Matt D. Smith, a friend and fellow designer, gracefully pointed out the fact that it looked a little similar to Five Four Club. Although the brands and logos expressed themselves differently, the mark felt less original and defining to Fort. And if Marky Mark Walhberg and 50 Cent wear Five Four, who’s gonna compete with that, right? (Scroll down on the Five Four page, you’ll see what I’m talking about). Although I was bummed at first, I’m ultimately glad it had to change because it made me realize how the mark lacked the character I was looking for. As another friend kindly put it, “Those F's were BOOORING.” If a mark is overly simple, it can lend itself to replication and unoriginality. Given the fact that the fine FontFont team utilizes “FF” in a clever way in their logo, I thought I should move away from the initials. So, I started from scratch and decided to dive into the land of the script. I wasn't going for perfection there because this was only to be a reference. Next, I took out some good ole sketch paper and a pencil and went to redrawing it with the intention of making it jive more. Warning: My sketching is poor. After scanning in the sketch, I brought the image into Glyphs. It’s a type design program, but I love the way it handles bezier curves and have found myself doing logo work in there more and more. I then refined and tweaked accordingly. The top of the F took a new shape and different nuances were brought out in the letters. My satisfaction in the logo was increasing, but it wasn’t fully there. I had exhausted my limited script skills and didn't have the eye to see how to refine and make it true to its sign-painteresque style. So... I asked a friend. Although the journey was a rocky one, I’m really happy with where it landed. Over the course of the next year or two, I hope to really dive into and study scripts. Maybe then, I’ll come out with a release of my own. I love what you came up with. I think i’s a strong brand identity with character. I also love the fort icon. I think I’m gonna have to get one of those Night Fort tees. Great work man! Great post Maddox! Enjoyed seeing your process.